Custom Stained Glass Windows Stained Glass Transoms Stained Glass Overlay, or SGO Contact Us! Located just outside of Philadelphia, Pa, Castle Studio Stained Glass is a full service glass studio accomplished at performing any requirements in the field of stained glass. We are proficient in the creation of new designs in stained glass windows and art work. Much of our work can be seen in churches all over the country. 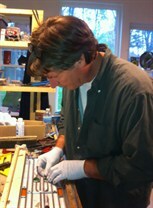 However, did you know we also perform residential stained glass windows repairs, restorations, and preservation too? The entire Main Line area, a suburban area just outside of Center City, Philadelphia, has many 19th century affluent homes built with custom stained glass windows. The Main Line isn’t actually a town. It consists of many towns such as Overbrook, Merion, Narberth, Wynnewood, Ardmore, Haverford and Bryn Mawr. The Main Line also encompasses many communities past Bryn Mawr including the Upper Main Line communities of Rosemont, Villanova, Radnor, St. Davids, Wayne, Strafford, Devon, Berwyn, Daylesford, Paoli, and Malvern. If you’re in need of anything from custom stained glass transoms, to stained glass restorations, or just re-silvering a mirror, we do it all for both residential and commercial clients! We provide both modern and traditional stained glass services, as well as the restoration of older stained glass windows and their frames. In addition, our unique designs in protective glazing systems generate a significantly greater venting area than other systems offered in the market today. With over 25 years of experience working in stained glass, we offer expert advice to our customers throughout the stained glass process so that they can feel at ease and informed regarding any decisions required throughout their projects. Whatever your project needs, Castle Studio can help you achieve a unique, creative solution that exceeds your expectations. To learn more about our projects and business, please explore our website or contact the studio. Castle Studio recently completed a project at Abington Presbyterian Church, in Abington, Pennsylvania. The church had two existing stained glass windows in the front of the church that were in areas with no interior light sources. While the windows could be viewed from the outside during the daytime, at night the windows appeared dark. To enhance the beauty of the church, they requested a lighting solutions for the windows that would allow them to be seen outside the church at night. Castle solved their issue by installing low-wattage LED light panels behind the windows, enabling them to be viewed in all their glory to passersby throughout the night. We are thrilled with the way it looks. It is just beautiful. We wanted to let you know how happy we are with your design and craftsmanship. ​Mobile-friendly web designers, Rochester NY.